For those of you who may have missed it, there was an interesting article in The New York Times last week lauding the resurgence of house-made veggie burgers on restaurant menus across the city. 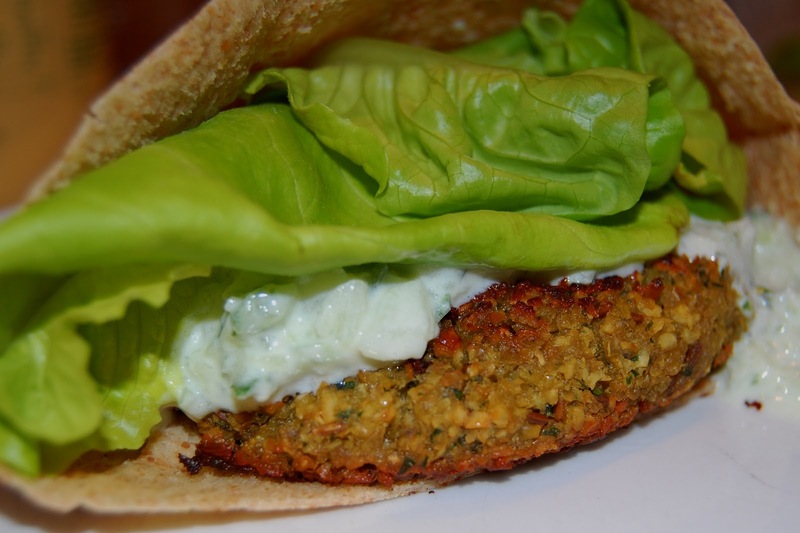 Besides being cheered by this news, the article led me to reminisce about the first and last homemade veggie burger I ever made, when I was in high school in the 70's and a devoted vegetarian. 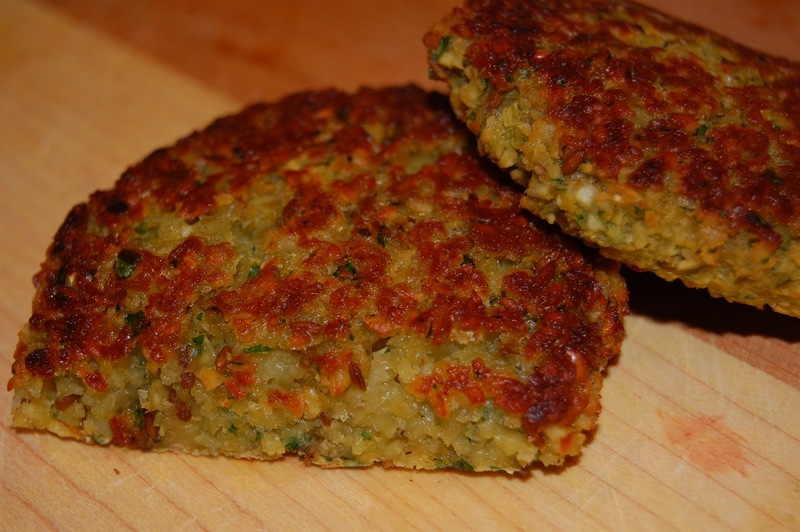 I clearly recall finding the recipe for "soybean patties" in the New York Times Natural Foods Cookbook. I'm sure I made a special trip to the health food store for soybeans in my mother's wood-paneled station wagon. I can imagine the car's vinyl upholstery fumes intermingled with Herbal Essence wafting from my hair. I see myself entering the store and pointing my pumpkin-colored Earth Shoes towards the dry-goods bins, and I'm certain I would have reached for a carob Tiger's Milk bar at the check-out counter. But what of the actual "soybean patties?" I have a vague memory of the blender's high-pitched whine as it labored to process the soybeans, but that's it. I'm thinking this means I didn't love them. So I was intrigued by the prospect of revisiting homemade veggie burgers after all these years. My first attempted recipe came from a respectable source, but it was disappointing. Copious bread crumbs worked well as a binder but the result was too bland to rescue no matter how many seasonings I added. Then an Amazon search led to a jackpot released last year: Veggie Burgers Every Which Way, by Lukas Volger. A little bit more digging led to the author's website, where I was surprised to find many of his recipes accessible for free. I opted for the book though, and after preparing falafel burgers tonight, I'm more than happy to support the author's effort. If you like falafel, you'll love these, and the fact that there's no deep-frying involved just makes them better. I'm really impressed by how fresh and flavorful they are, and they're simple to make too. 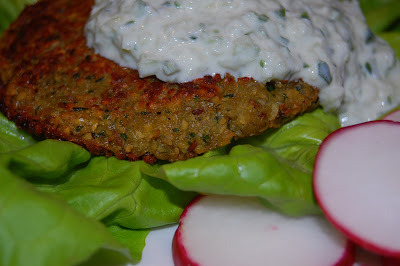 I made my own cucumber yogurt sauce (tzatziki) as an accompaniment, although there is another version in the book. Place chickpeas in a medium sized bowl and cover with water by 4 to 5 inches. Let sit 24 hours; drain thoroughly. 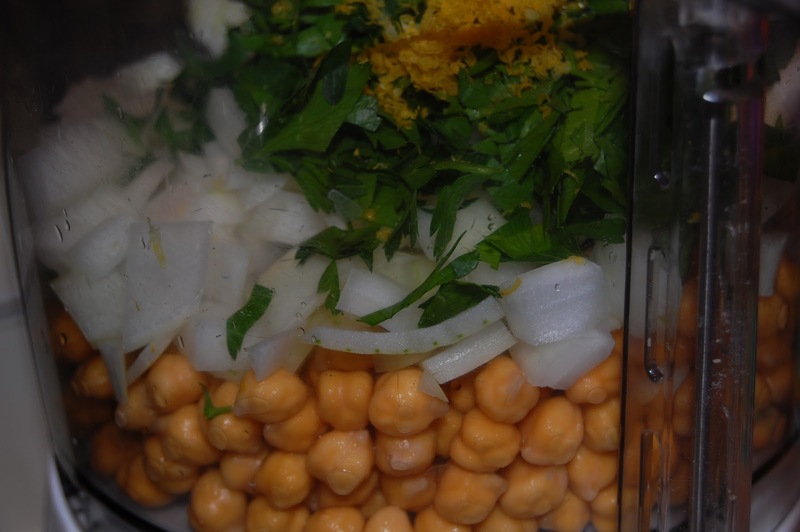 Place all ingredients but chickpea flour in the bowl of a food processor. Pulse until coarsely combined. If the mixture is struggling to come together, add a bit of water, but no more than 2 tablespoons. If water is added, stir in chickpea flour. Adjust seasoning. Shape into 6 patties (mixture will be fairly wet). Place the patties on a well-oiled baking sheet. Bake for 15 to 20 minutes, flipping once halfway through, until golden and firm. 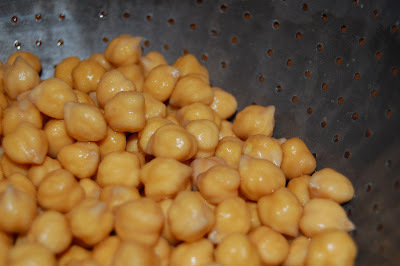 Don't try making these with canned or precooked chickpeas; the chickpeas here are simply soaked and then ground in a food processor. 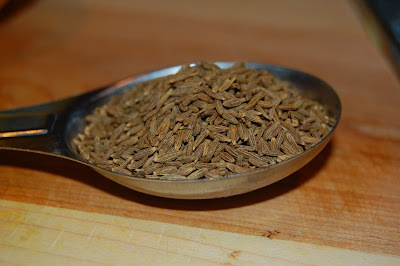 To toast cumin seeds, place in a small frying pan over high heat and toss frequently until their aroma is released, 2 to 3 minutes. Don't be concerned if the mixture seems wet even without adding water. The patties dry out a bit during baking and have a perfect level of moistness in the end. They also hold together well without added flour. 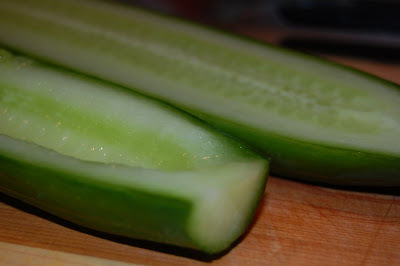 Cut cucumbers in half lengthwise and scrape seeds out with a spoon. Discard seeds. Cut cucumbers into a large dice and toss in a mesh strainer with salt. Set aside to drain for at least an hour or preferably two. Rinse lightly with cold water just before using. Squeeze cucumbers by hand to remove excess liquid and add to bowl of food processor. 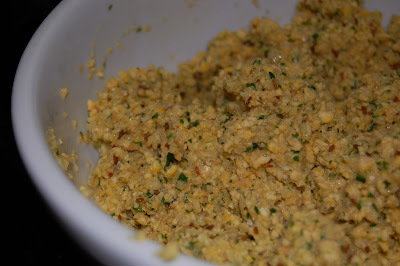 Add half of yogurt, olive oil, vinegar and garlic and pulse until mixed but not completely pureed. You want to retain texture from the cucumbers. Dump contents into a bowl and stir in rest of yogurt. Add salt and pepper to taste. Cover and refrigerate. These were so good, we made them twice! Of course, the first time, I didn't read the instructions and used pre-cooked chickpeas... The flavor is excellent - the seasoning of the burgers are a prefect complement for the sauce. These are on the list of things we'll make for guests! Thanks! And as always, thanks for so many great vegetarian recipes. Thanks S - so glad you gave them another shot with soaked chickpeas! Timbul Rasa Sakit Saat Olahraga, Apakah Kista? Kaker leher rahim merupakan penyakit yang sangat berbahaya maka dari itu sangat penting bagi anda mengetahui Cara mengobati kanker leher rahim baik secara medis ataupun secara alami salah satunya adalah bisa dengan mengkonsumsi Obat tradisional kanker leher rahim yang terbuat dari bahan alami pilihan, dimana cara ini lebih aman dan saat ini menjadi Pengobatan Kanker rahim yang banyak dipilih dan lakukan. Sehingga tidak heran jika saat ini banyak Obat Kanker leher rahim yang terbuat dari bahan-bahan alami. Bagi anda penderita liver kronis ataupun liver bengkak konsumsi rutin ekstrak teripang atau gamat emas adalah solusi yang paling tepat untuk mengatasinya, selain itu teripang emas juga sangat efektif mampu menghilangkan bekas luka bakar dengan cepat tanpa bekas. Bahkan kedahsyatan teripang emas bisa mengobati penyakit langka seperti lupus dan kusta. Thanks I can learn alot from this blog. It is very informative. I like the way you design this web. Terimakasih atas informasinya gan, semoga bermanfaat untuk kita semua. jangan lupa untuk update terus ya gan !!! Link Kami Semoga Bermanfaat Untuk Informasi Seputar Kesehatan. Very nice information. I am happy to read it and may be useful for all of us. 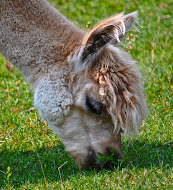 This is a very wonderful page happy to be on your page I found your page from google. Reduced noise disturbance kinja.com/ implies they could be made use of in Here the bedroom without disruption as well as in Far Infrared Saunas – A Bloke’s View general will certainly provide you great deals Infrared Saunas 2017 more enjoyable usage. If quiet operation is Best Infrared Saunas Reviews important to you. Apakah Keratitis Bisa Disembuhkan ?